When 13 is not unlucky. Mini calc with dynamic summary. How to convert bi-weekly to monthly. Enter the current balance you owe on the loan. Due to compounding interest, the amount you owe cannot be arrived at by simply multiplying your payment amount by the number of payments remaining. You may need to call your lender to find out the exact amount you owe. Enter the annual interest rate you are being charged for the loan. Enter as a percentage, but without the percent sign (for .06 or 6%, enter 6). Enter the number of monthly payments remaining on the loan. If you would like the calculator to generate an amortization schedule, select the month and day, and enter the 4-digit year, of the date you will make your next biweekly payment. If you would like the biweekly amortization schedule included in the results, select either 1st Year or Full. Otherwise choose None. This row shows you the payment amount, number of months, and interest charges based on making a monthly loan payment. This row shows you the payment amount, number of months, and interest charges based on switching from a monthly loan payment to a bi-weekly loan payment. This row shows you the time and interest you will save by switching from a monthly loan payment to a bi-weekly loan payment. This calculator will calculate the time and interest you will save by switching from making monthly loan payments to bi-weekly loan payments. The results include a time and interest comparison chart along with a bar graph that visually depicts the savings. The calculator also includes the option of adding an extra amount to your biweekly payment, either on a biweekly (fortnightly) or on a monthly basis. Finally, you can set the calculator to show the first year or full biweekly amortization schedule, or show no payment schedule at all. And if you choose to include one of the amortization schedules, the calculator will generate a printer friendly version for printing. 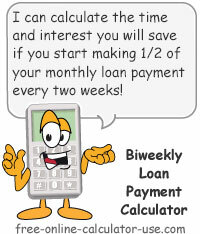 Note that if you are simply looking for a calculator to compute the payment and interest on a new bi-weekly loan, please visit the Bi-weekly Loan Calculator. Enter the current principal balance owed on the loan (call your lender if you're not sure). Enter the annual interest rate you are being charged. If you would like to apply an extra amount to your biweekly payment amount, select the frequency and enter the amount. If you want the results to include an amortization schedule, showing when will your loan be paid off with biweekly payments, set the date of the next payment and choose "Full Amortization Schedule" from the drop-down menu. Tap the "Calculate Biweekly Savings" button. This will populate the payment comparison chart and display a bar graph comparing the interest costs of your present monthly payment, with the costs if you switch to a biweekly repayment plan. This will also display the amortization schedule if you chose to include one. To print out a report, which includes the displayed amortization schedule, tap the "Printer Friendly Report" button. This will open the report in a new window for printing. Making payments once every two weeks. If you have an existing loan you are making monthly payments on, simply start making 1/2 of your monthly payment every two weeks (26 half-payments per year). This results in making 13 payments per year versus the normal 12 payments and usually results in significant time and interest savings. How switching to biweekly payments works, and what to watch out for. In most cases you can save a lot of time and money by simply making 1/2 of your normal monthly loan payment every two weeks. That's because doing so results in making one extra loan payment per year (13 instead of 12) without hardly noticing the difference in your cash flow. As you will see when using the full calculator, this small change in your loan repayment method can make a huge difference in the amount of interest you will end up paying. But before you switch to making bi-weekly payments be sure to check with your lender to make sure they allow you pay off your loan ahead of schedule. Some of the sneaky devils just hold your extra payments in escrow and apply them based on the original monthly amortization schedule. Example: Convert $500 bi-weekly payment to monthly equivalent.